Located in Dawlish, Lyme Bay House offers free WiFi. This 4-star guest house offers a shared lounge. Guests can make use of a bar. All rooms in the guest house are fitted with a kettle. Each room is equipped with a private bathroom, while some feature a sea view. At Lyme Bay House every room has a wardrobe and a flat-screen TV. Breakfast is available daily, and includes continental, Full English/Irish and Asian options. Torquay is 19 km from the accommodation, while Exeter is 23 km from the property. The nearest airport is Exeter International Airport, 26 km from Lyme Bay House. Set in Teignbridge in south Devon, Dawlish is a lovely seaside town on the mouth of the River Dawlish, and the perfect destination for a relaxing break. This little town grew from a small fishing hamlet in the 18th century, and today it's a popular tourist spot. The town's hotspot is the scenic seafront and sandy beach, but there are lots of other great ways to spend a lazy afternoon in Dawlish. A trip to the town wouldn't be complete without a visit to the Dawlish Museum. Set within a quaint and unassuming building, the museum charts the town's history through the ages, and it's a relaxing way to spend a few hours. It's also definitely worth seeing some of the beautiful natural landscapes in and around the town. The Dawlish Warren Nature Reserve takes you along the beach and across the dunes so you can have a leisurely stroll and soak up the atmosphere and sea views. If you're feeling a little more active, why not visit the Dawlish Warren and play a bit of mini golf and even try your hand at go karting. Or, time your visit with the annual Dawlish Air Show to catch the Red Arrows in action. Typical of a charming waterfront town, there are lots of traditional and buzzing pubs and cafés to visit during your stay. Jack Sprat's, The Smugglers Inn and The White Hart are all worth checking out. 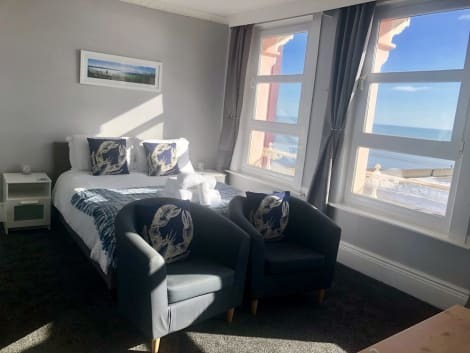 For Dawlish hotels, see if you can book into somewhere authentically English and central to really immerse yourself in the atmosphere of this vibrant little town. The Langstone Cliff Hotel is one great option, and popular B&B's include Lammas Park House and Dunlace House. So, if you're looking to get away from it all in a peaceful and quaint setting, make sure to check out Dawlish. It won't disappoint.